have tissues on hand while watching the video. I had wanted to do a song about Ruffian, so I started my research by visiting as many websites as I could that were devoted to her. Then I bought a copy of the book "Ruffian: Burning From The Start" by Jane Schwartz. Still not having anything started on paper, I was able to find copies of three different TV documentaries so I could actually see and hear some of the people involved in her life. Then, I found copies of the original track tapes of all ten of her career races. Still, about 9 months of research wasn't getting me started on a song. Then, a chance encounter, on the net, with someone who had been in the stands the day of The Great Match, provided the inspiration needed to start building the story. July 6, 2005 marked the 30th anniversary of The Great Match. I wasn't looking for this subject, I received this story in an e-mail message one day. Just a one paragraph story with several pictures. The pictures helped me fill in the blanks that the printed story left out. I don't know the mule's name, only that this took place out in Arizona somewhere. That's me on both the rythm and lead guitars, plus I made the sound of hoof beats in the background with a plastic cover off of a bulk CD-R canister. This song is about Eclipse Award winner, Lost In The Fog. Reportedly one of the best horses to come out of California since Seabisquit. He was undefeated in his first ten starts. In 2006, something started to go wrong, as he won only one of his next four starts. Acting colicky, he was taken to the vet clinic where it was discovered he had cancer. Several small tumors were located along his back and a rather large football sized tumor was pressing up against his spleen. When the pain became too much, he was euthanized in September of 2006. I started writing a song about Barbaro during the 2007 Oklahoma ice storm, when my power was out for 11 days. At that time, Barbaro was still alive and, like a lot of other people, I was now sure he was going to make it. Unfortunately, that all changed a week later. Sadly, I had to start reworking the lyrics to reflect his passing. It is now complete and I hope meets with approval from his many fans. Just like my songs about Dan Patch and Ruffian, this song started out as a completely different one. The melody and story line just weren't working, so I "borrowed" the melody and chord pattern, used it on Highland Dale which I wrote in one evening, then started all over on a song about Poco Lena. I wanted something more upbeat that might be able to take on a "Texas swing" feel when elaborate instrumentation was added. I finished this song shortly after midnight on May 1st (2005). When I got up the next morning, I quickly put it down on my 16 track. This song hits a little closer to home since Poco Lena turns up in the pedigrees of five of my horses through Doc O'Lena. Three of them are my young Quarter Horses and two are my younger Appaloosas. Had Poco Lena not survived, I might have five totally different horses standing in my pastures today! Everyone remembers the great Secretariat, but few remember his pony horse known as Billy Silver. 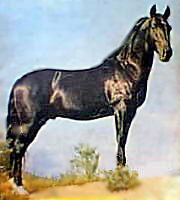 Billy Silver had obvious Appaloosa markings and turns up in many of the old pictures of Secretariat. While he was called Billy Silver, if he was registered with the Appaloosa Horse club, that was not his registered name. There is a Billy Silver registered with the ApHC, but that Billy Silver was born in 1971 and would have been too young to have already been working as a pony horse on the tracks. This was my very first "horse" song. I knew the basic story about Dan Patch long before I ever started writing my own material, so he seemed like the logical place to start. Both Marion Savage and Dan Patch were rags to riches stories, in their own right, before they came together as a team. Marion Savage (The Parson) was raised on an Ohio farm and tried many unsucessful business ventures before hitting it big with his International Stock Food Company in Hamilton, Minnesota. Dan Patch had such crooked legs when he was born that he needed human assistance to stand and nurse the first few days of his life. Dan was a fast horse by the time he was aquired by The Parson and the stock food company was already a $1 million a year business. Within the first year together, Dan started breaking track records and Marion's feed business went from a $1 million to a $5 million a year business. They both left this world within 36 hours of each other. Today, twin radio broadcast towers stand on the site that once was home to the Parson's famous training stables. Not about one horse, but a whole group of horses. By the mid 1920's, the fire horse had pretty much disappeared across the country, having been replaced with mechanical engines that ran on gasoline. This song is a composite of several stories I ran across while studying the subject of fire horses. 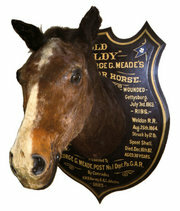 I believe Jim, the horse mentioned in the song, worked for the Toledo Fire Department, while the pictures are from departments from the east coast to the west. What do I do when not searching out another great horse story to (hopefully) work into a song? I spend some time with my own. I bought my first horse back in 1974 and things sort of grew from there. I've never built any kind of building from the ground up and from scratch, but I think my new two stall foaling barn turned out quite well for a one man project, even if it did take me almost a year to complete! This is one the three songs about horses from the Civil War. Old Sam didn't belong to a famous General or other commander, he was a carriage horse from Michigan that ended up pulling artillary. It wasn't long after I stumbled across this story that I knew I had to put this into a song. Captured from a Union supply train, two of the horses taken were presented to Col. Thomas Jackson. He planned to keep the larger of the two for himself and give the smaller one to his wife. However, the larger one proved to be too rough of a ride, so he kept the smaller one instead. Col. Jackson, who would later be promoted to a General in the Confederate Army, called the horse "Fancy" while the enlisted men refered to the horse as "Little Sorrel". The latter name stuck. Stonewall Jackson didn't live to see the end of the war and Little Sorrel was sent home to the General's wife. Probably the most sucessful "stand alone" equine actor ever to set hoof in Hollywood. By "stand alone" I mean he wasn't part of an act, like Trigger or Topper or Champion. He was owned by his trainer, Ralph McCutcheon, who leased or rented him out to the studios. Ralph never called him a trick horse, though he knew dozens of them. He prefered to call Highland Dale a highly trained horse. Ralph did say, however, that his best trick was earning $5,000 per week! His "career" started, at age 3, when he got the leading roll in the 1946 version of "Black Beauty". He won Patsy Awards (the animal actors' Oscar) for his roll in "Gypsy Colt" and the black horse, Beauty, in the movie "Giant". He had leading parts in a total of 13 movies. His 21 year movie career came to an end in a 1967 episode of "Bonanza", at the age of 24. He lived to a ripe old age of 29, despite being plagued with heaves, an equine breathing disorder like asthema, that bothered him most of his life. He is best remembered as the black stallion, "Fury", in the television series of the same name, from the late 50's. The melody came from a song I was working on about Poco Lena, but it just didn't seem to fit her, so it's back to the drawing board on that one. 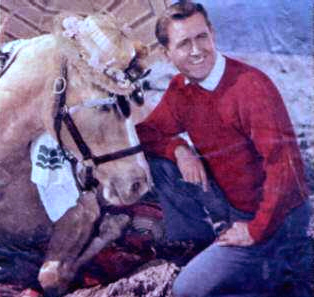 While maybe not as sucessful, dollar wise, as Highland Dale and having a much shorter career, Bamboo Harvester is one of the most easily recognizable equine actors ever to hit Hollywood. After I had written the song and had it copyrighted, I found out the part about the peanut butter was incorrect. 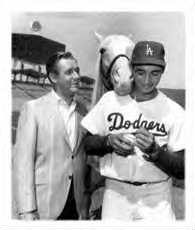 Originally, Alan Young, who played "Wilbur", said that they got "Ed" to move his lips by feeding him peanut butter, suggesting that the peanut butter stuck to the roof of his mouth. Within the last year or two, he has since said that he made that story up and they actually placed a piece of soft nylon between his gum and his upper lip, which he then tried to remove. After about a year on the set, he became so used to the routine, that all "Wilbur" had to do was stop talking and "Ed" would start moving his lips. Bamboo was already 11 years old when the series first aired and 17 when it ran for the last time. He lived for two more years after the series ended. This song is dedicated to all the animal heroes I had while growing up in the '50's, including Lassie, Rin Tin Tin, Trigger, Flipper, Fury, Flicka and, of course, Mister Ed. This song is about one of the worst train wrecks in Illinois history. The rail line actually ran from New York to Iowa, and this particular night train was making stops along the way, picking up travelers on their way to Niagra Falls. Before passing through the town of Chatsworth, Illinois, the lead engineer could see an orange glow off in the distance. He figured that something up ahead was burning, but wasn't able to see what it was. The train was traveling about 60 mph. As they drew closer, the engineer decided that because the fire was so close to the ground, it must be a brush fire. It wasn't until the train was too close to stop that he realized the trestle was burning. The lead engine had enough speed and momentum to make it to the other side as the trestle began to collapse under the weight of the train. The coal tender, behind the lead engine, and the second engine went down with the burning trestle. The train's momentum sent five wooden coaches, filled with passengers, down into the revine on top of the second engine and a pile of burning timber. There was speculation, at the time, that the trestle might have been deliberately set ablaze to get the train to stop so its passengers could be robbed while they were groggy with sleep. There was never any real evidence to prove or disprove that theory. I passed through Boynton, Oklahoma, for the first time in November of 2003. It's about as close as you can get to being a modern day ghost town. All along the main drag, the structures that are still standing are either boarded up, or have "For Sale" signs in the windows. At the far north end of town, one building stands with lights on inside and is open for business - the Post Office. I never forgot my initial reaction, but it would be five months later before I would sit down and write this song. Once started, the song came easy. From start to finish, it took about an hour. One of Illinois' and the nation's worst mining disasters. A chain reaction of "errors" that was compounded until things were out of control. The Cherry mine was huge. It had three levels, but it was also modern, having electric lights down below. That was a big thing in 1907. However, the lighting system developed a short and the mine reverted to kerosene torches stuck into the mine walls for light. This went on for almost a week without mishap. The mine was so large, they had actually carved out a large room where the mine's 41 mules, used to pull the loaded coal cars, could be stabled. It was near closing time and two workers had loaded up one of the coal cars with hay for the mules. They shoved it down the tracks to where the mule stables were then turned out and walked away. When the cart stopped, it stopped right underneath a dripping kerosene torch. It wasn't long before the cart caught fire. However, small fires were common in the mines in those days, so several miners actually walked by this burning cart of hay and paid little attention to it. When someone did finally decide to take action, the fire in the cart had gotten so large that they couldn't put it out. A decision was then made to dump the load of hay down to the bottom of the shaft where it would burn itself out. Once at the bottom, the fire didn't go out and soon set fire to the timbers lining the shaft. Since fire, by nature, rises, it wasn't long before the whole shaft was ablaze. The whistle on the surface soon sounded three short blasts, a signal to the townfolk that there was trouble in the mine. George Eddy, the manager of the mine, heard the signal. Though up in years, decided he needed to go down personally to do what he could to aid the miners below. George was soon trapped below with 19 miners. George was very well versed with mining and all the dangers it involved. Everytime something changed below, he knew what they were doing and thinking up above. He was able to lead that group of 19 to a far corner of the mine, where they walled themselves in for seven days before being rescued. It was the only bright spot in a disaster that would claim the lives of some 240 miners. There are a few people who have heard most everything I have written, my Illinois horse trainer being one. One day she was "hinting" that I had used just about everyone's name at the barn in a song except her's. On April Fool's Day, 2004, I sat down and wrote this one about an actual event that has been going on every April 19th in the town of Beaver, Oklahoma, for almost 40 years now and I stuck her name in it. Back in the days of the giant cattle drives, Beaver was a stop along the way. In those days, the people of the area didn't have much, so they had to make the most out of what was available. One thing they had a lot of was cow chips. The town's annual celebration is a humorous way of remembering those times gone by. I made this recording shortly after getting my 16 track recorder, then never updated it. My playing is a little less than accurate, but I did have fun experimenting with channel seperation for the stereo effect.That's me on guitar, banjo and bass box (a sort of giant thumb piano). The rhythm is a computer program. They say truth is stranger than fiction and this song is based on historical fact. The only part that has been made up was the part about Billy's wife being unfaithful. I put that in there as a way to show how I, the storyteller, happened to know all of this information. At the time this story unfolds, Illinois had been a state less than ten years. Law and order was almost non-existant. The southern tip of Illinois was a dangerous place in those early days. Travelers that made it the entire length of Ford's Ferry Road, without being robbed by one of the members of James Ford's gang, were likely to stop in Potts' Tavern, where they were just as likely to be robbed and murdered. There was speculation that James Ford and Billy Potts might have worked together for awhile, but recorded documents from that time period leave plenty of room for speculation. I have a sister song to this one called "Ford's Ferry Road" that continues the story. Another piece of early Illinois history. This is also a sort of campanion piece to Potts' Tavern, in that it's from the same time period, the early 1800's. Many travellers heading west never made it to Potts' Tavern because of the dangers lurking on Ford's Ferry Road. Mr. Ford owned the ferry that crossed the river and also had a gang of thieves working for him. When someone, who appeared to be well-to-do, crossed the river on the ferry, one of the gang would ride along and befriend the traveler, eventually robbing the person. This song is based on fact, but no particular incident. This is one of my earliest songs, written in September of 2003, and my first historical song. Material for this one was easy to come by since this happened in the town I lived in back in Illinois. Braidwood is located just 45 miles southwest of Chicago. Back in the late 1800's and early 1900's, the area was a thriving coal mining area and Braidwood was Will County's second largest town. The area is extremely flat, so water generally has very little place to go. Some mines were strip mines, while others went underground. The Diamond Mine was an underground mine with a small earthen dike to prevent water from running in. Like many mines, however, water would continuously seep in the walls of the mine. The weather had turned warm for a February day, in northern Illinois, and it began to rain. The snow that was already on the ground prevented the rain water from penetrating into the soil and it began to collect on the surface. Down below, the "pump man" noticed the water inside the mine was rising and thought the problem was with the steam pump on the surface. A trip to the top found the pump running full speed with the engineer, the person who actually ran the pump, indicating no trouble on the surface. However, the incoming water continued to outpace the pump until the earthen dike on the shaft's east side gave way, sending all the water that was collecting on the surface from the unseasonable rain down the mine shaft. Inspired by an e-mail that was going around a few months before the 2004 election, aimed at those people who have sort of taken the voting process for granted. I did some research and had ordered the DVD "Iron Jawed Angels", in hopes of adding a little more insight to what I had already learned. I didn't wait for the DVD to arrive. The history lessons taught in school are, many times, glossed over footnotes to events that actually happened. This most certainly is an example of that. This song is unual in that after I recorded it, I sent the song file north to IL, where a contact recorded the violin part and sent the file back to me. I downloaded the violin part into my 16 track then mixed it. I've never met the violin player and the two intruments were recorded in two different states. Ah, the marvels of modern technology. Mr. Moffat envisioned a rail line across the Rockies from Denver to Salt Lake City. The rail line actually went up over the top of James Peak and on top of the mountain. A small resort town sprung up, which became quite popular with the folks in Denver. A hotel and Post Office were built there. Because of the elevation, however, snow had to be plowed from the tracks nine months out of the year, which virtually consumed most of the entire year's profit. The line never made it to Salt Lake City as Craig, Colorado, would be the end of the line. By the later half of the 1920s, a 6.2 mile tunnel was completed through the base of James Peak, making what had become known as "the Hell Hill Route" obsolete. The track "over the top" was eventually pulled up and the D & S L was merged into the Denver & Rio Grande (D & R G). While the tunnel still remains, the Denver & Rio Grande was bought up and merged into Union Pacific. One of my earliest songs to be included here, written in the fall of 2003. In September of 2003, I was still living in northern Illinois. About that time, on I-55, south of Chicago, Tina Bell, a construction worker, was holding a "Slow Down" sign at the mouth of a construction zone. There she was struck and killed by a driver under the influence, driving without a license. Both she and her husband worked full time to support a total of seven children. I never intended to write this song. I wanted to write a song about how people wave at each other on the back roads as they pass by. I thought the idea was good, but I wasn't getting anywhere. Weeks went by and I had nothing. One day, I said to myself, "You're going to write that song today, PERIOD!" So, I started by sitting myself down on that gravel road, at the beginning of the song. However, by the end of the first verse, I found myself in the cafe in town! Now, what? I no longer had a plot! I liked the melody and what I had to that point, so I decided to "press on". As long as I was in the cafe, I needed some people. Started naming them after real people at my horse trainer's barn. I'd write a line, find a rhyming word, then build a sentence around it. I kept going for three more verses that way. Then the song started to get long and was losing it's direction, so I needed a way out, a closing. I figured that might be a good place to stick in an instrumental break while I pondered the problem. A short while later, I began to ask, "Just how does one leave a cafe?" From that point on, I knew how I was going to write the closing. The four final words ended up becoming the song's title to boot! I probably had more fun writing this song more than any of the others. Hope you enjoyed these songs. Thank you and do come again!